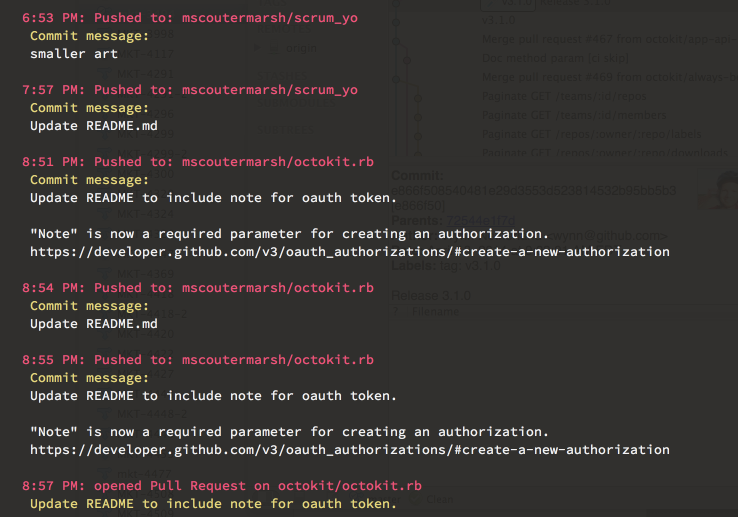 ScrumYo is a command line tool that shows you all of your recent GitHub commits and pull requests. It helps you get quickly prepared for your daily scrum/stand up meeting. What’d you get done yesterday? Almost every morning I’d be scrambling through my Git logs to remember exactly what I finished yesterday. So I wrote ScrumYo. Install it like any other gem. Or, if you’re using RVM, add it to your global gemset. Once installed, use the scrumyo command. The first use you’ll be asked to login to your GitHub account (it even works with two-factor auth! ).